A student speaks at the annual NU Active Minds panel on mental illness stigma. Students shared their personal stories and challenges about dealing with mental illness on campus. With the intention of working to destigmatize mental illness on campus, a panel of students discussed their personal experiences with mental health at an event hosted by NU Active Minds on Thursday night. The panel comprised four Northwestern students who shared their personal stories, after which they answered questions from the audience. Roughly 40 people attended the event held in Harris Hall. The Weinberg sophomore also emphasized that sharing personal stories regarding mental illness isn’t for everyone and that everyone’s journey is different. “The model of surviving and thriving with a mental illness should be one of variation and not of standardization,” Hawley said. 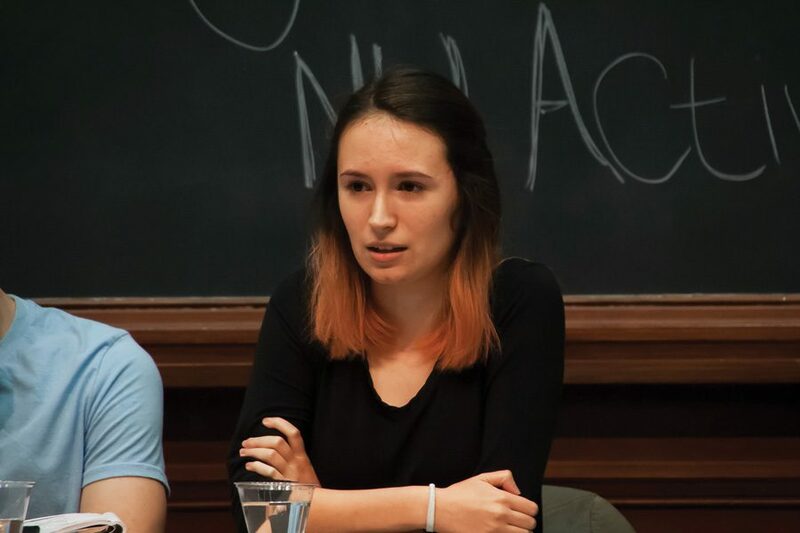 Although audience members and speakers appreciated a space to discuss the topic, Weinberg sophomore Karolina Leziak told The Daily she believes NU’s campus culture can make it difficult to speak out about mental health. Both Leziak and SESP sophomore Elizabeth Phillips, who also attended the panel, expressed admiration for the University’s decision to end Counseling and Psychological Services’ 12-session limit. Still, it sometimes feels as though campus resources are too finite, Phillips told The Daily. Panelist Josh Coffey said he has found that Greek life can provide students with a support system. Coffey said taking a quarter off helped him truly develop a sense of self. Likewise, Hawley said the quarter system lets students take time off to seek treatment without falling too far behind. Though the panel discussed serious topics such as anorexia, social anxiety and clinical depression, Coffey remained optimistic about the perception of mental illness and mental health on campus. “If people took the time to really look into it more, things would get a lot better,” Coffey said.